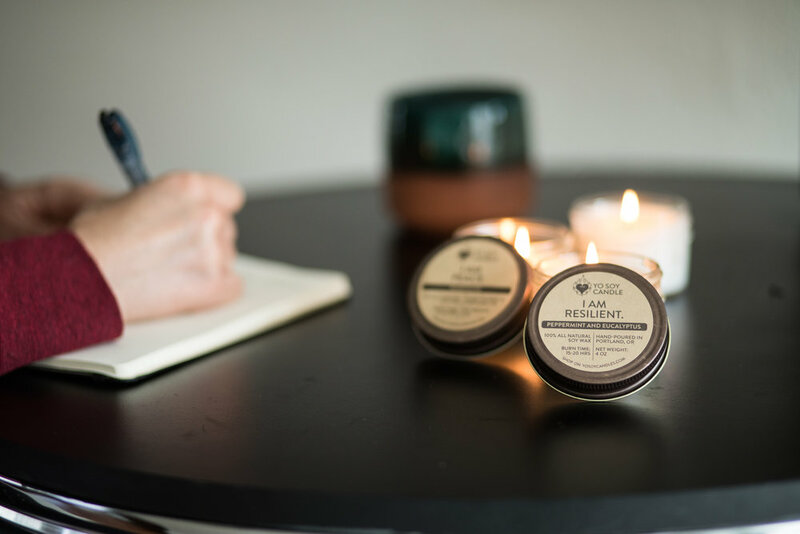 Eco + conscious candles with a purpose. Rituals don't have to be complex or take hours to complete. In fact, they can be so accessible and woven throughout your busy day without even taking too much extra time. A series of actions or type of behavior regularly and invariably followed by someone. Simple, right? I want to go ahead and add that rituals are actions and behaviors that are good for you and therefore good for everyone around you. Several years ago I decided to dedicate my life to becoming a high vibration of a human by connecting with myself daily, being kind to others, listening and observing more and loving myself for who I am. I choose daily affirmations as a way to encourage these intentional behaviors which eventually led to Yo Soy Candle but I will save that story for another time! Light a few Yo Soy Candles with "I Am" statements that resonate that day, take a shower or bath with soothing music. After, I meditate or sit and breathe for about 5-10 minutes then take 30 minutes to reflect on the day while writing in my journal. My writing usually consists of daily gratitudes, self acknowledgments/challenges and goals, ideas or intentions I have envisioned to put into action. Shortly after, I feel complete and ready to fall asleep. The next morning I usually wake up feeling refreshed and ready to take on the day. I acknowledge my challenges (without judgement) and write affirmations for the day reminding me that I get to choose my thoughts, words and actions towards myself and others. I observe myself, love myself, find compassion and empathy for others as best as I can. Then I rinse and repeat. I would love to hear your daily rituals! Please share in the comments. ©2012-2019 Yo Soy Candle® LLC. All rights reserved.